LONDON (AP) — Five-time Wimbledon champion Venus Williams won, and top-ranked Angelique Kerber lost. 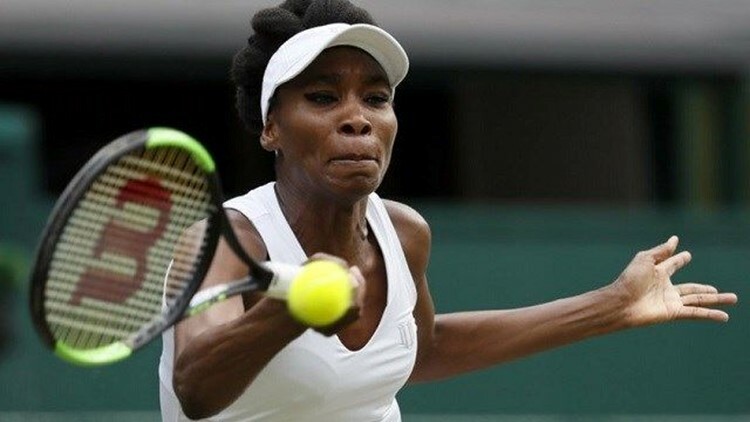 Williams, who last won the title at the All England Club in 2008, advanced to the Wimbledon quarterfinals by beating 19-year-old Ana Konjuh 6-3, 6-2 on Monday. Williams is playing at the grass-court major for the 20th time in her career, with her Wimbledon debut coming a few months before Konjuh was born. "Winning never gets old at any stage in your career, ever, ever," Williams said. Kerber, who reached the Wimbledon final last year but lost to Serena Williams, was beaten by Garbine Muguruza on No. 2 Court, 4-6, 6-4, 6-4. With the loss by Kerber, either Simona Halep or Karolina Pliskova will take over as the top-ranked player after the tournament. Halep also advanced Monday, while Pliskova lost in the second round. Williams will next face French Open champion Jelena Ostapenko in the quarterfinals. The 20-year-old Latvian, who won her first tour-level title at Roland Garros last month, beat fourth-seeded Elina Svitolina 6-3, 7-6 (6) on Court 12. "I think I'll see what happens when I get out there," Williams said of Ostapenko. "I mean, I'm sure she hits well off all sides. I have to see what the nuances are once the game starts, because you can't necessarily plan for those." Ostapenko led Svitolina 5-3 in the second set, but was broken and forced into a tiebreaker. She finally won by converting her eighth match point. Ostapenko had never before been past the third round at a major tournament prior to this year's French Open. She was the first woman to win her debut tour-level title at a Grand Slam tournament since 1979. At Wimbledon, Ostapenko is into the quarterfinals for the first time. However, she won the girls' title at the All England Club in 2014. "I think I play better with every match, also like at the French," Ostapenko said. "So I hope I can keep it up." Two-time Grand Slam champion Svetlana Kuznetsova, Magdalena Rybarikova, CoCo Vandeweghe and Johanna Konta also advanced to the quarterfinals. The second Monday at Wimbledon is, arguably, the busiest day in tennis. All 16 fourth-round matches at the All England Club are played on the same day, a schedule that will produce all eight male and all eight female quarterfinalists. The first man to reach the quarterfinals was Marin Cilic. The seventh-seeded Croat beat Roberto Bautista Agut 6-2, 6-2, 6-2. Cilic, who won the U.S. Open in 2014, will be playing the quarterfinals at the All England Club for the fourth straight year. Top-ranked Andy Murray also won, beating Benoit Paire 7-6 (1), 6-4, 6-4 on Centre Court. The defending champion will next face Sam Querrey on Wednesday. The 24th-seeded American defeated Kevin Anderson 5-7, 7-6 (5), 6-3, 6-7 (11), 6-3. Kuznetsova was the first to finish her match on Monday, beating Agnieszka Radwanska 6-2, 6-4. The seventh-seeded Russian is a two-time Grand Slam champion who will be playing in the Wimbledon quarterfinals for the fourth time. She has never advanced past that stage. In the quarterfinals, Kuznetsova will face Muguruza. Rybarikova, who beat Pliskova in the second round, defeated Petra Martic of Croatia 6-4, 2-6, 6-3 and advanced to the Wimbledon quarterfinals for the first time. In the quarterfinals, Rybarikova will face Vandeweghe, while Halep will play Konta.